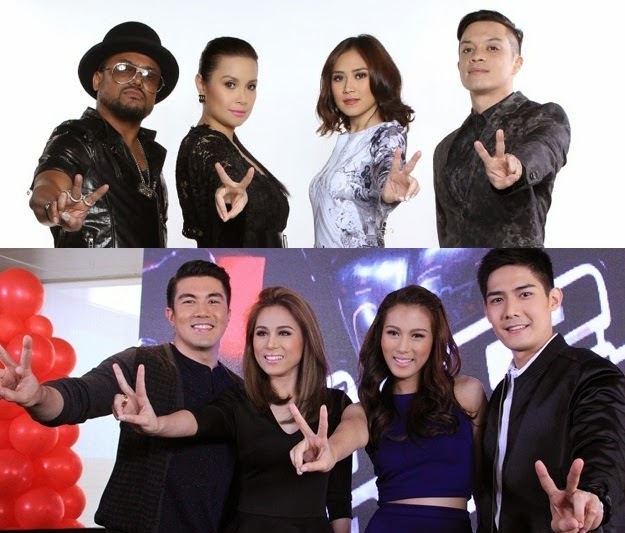 MANILA, Philippines - The country's leading and Twitter-trending vocal competition “The Voice of the Philippines” is back on its brand new season this Sunday, October 26, 2014 at 8:30 PM on ABS-CBN. The Season 2 of the best singing competition in the country features superstar coaches Apl de Ap, Sarah Geronimo, Bamboo, and Lea Salonga, with the solid team of multi-awarded host Luis Manzano, Robi Domingo, Alex Gonzaga, and the ultimate multimedia star Toni Gonzaga. “I’m really happy about the hosts of Season 1 and Kids teaming up. Of course, I’m proud to be back too, since this format is really close to my heart. We get to discover more talents and I’m sure it’s going to be an exciting season,” said Toni. Luis, who hosted “The Voice Kids,” shared that Season 2 brought him a brand-new experience because aside from his regular hosting duties, he also went to different places in the country to personally invite artists to join the blind auditions. “In ‘The Voice Kids,’ we were very impressed by big voices coming from little children, and that proves that innate talent of Pinoy singers. This season, I got to travel the country and I saw the amazement and joy in each artist when I gave them the envelope. During the blinds, I surprised and checked on some of them. So I got to know their inspirations and motivations,” Luis shared. In Season 2, coaches Apl, Sarah, Bamboo, and Lea will have to assemble 14 artists to form a team by the end of the blind auditions. The new season will also introduce the ‘steal,’ which will definitely add spice and excitement to the competition. During the battle rounds, each coach will have to pit two artists against each other and choose only one that will move on to the next round. If a coach likes an artist, he or she can ‘steal’ the losing artist. If two or more coaches like the losing artist, the artist, just like in the blind auditions, gets to choose which coach or team to transfer to. “This season is going to be more thrilling, and that’s going to fuel an even intense competition among the coaches. Palaban lahat. I’m glad to be of service and show the latest happenings in the program. There are lots of great singers this season,” Robi said. Robi and Alex will again serve as the program’s V-Reporters, who will deliver online the latest and most significant updates backstage and behind the camera. Meanwhile, Alex has also been a visibly active singer-performer, which she said helped her in her hosting. “Actually, singing is also my passion, so I can totally relate to singers and our artists in ‘The Voice.’ It’s just that I have not gotten my big break in singing. As of the moment, I focus on my acting, hosting, and being an author. But I’m not closing my doors,” joked Alex.